We’re coming back to business after the long weekend (at least for us in Poland). Please find a new Opera developer release to help with a good start to your week. Our goal is to make browser updates more visible and friendly for users. 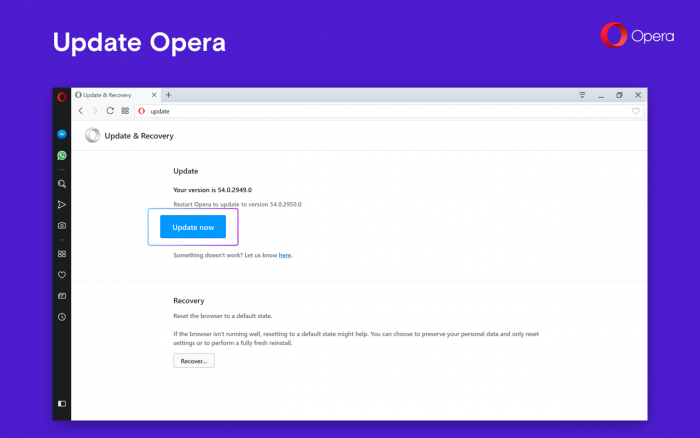 We also want to make resetting your Opera browser easier. Every time a new version of Opera is available, you’ll be informed about it with a red dot (as it was before) visible on the O icon. 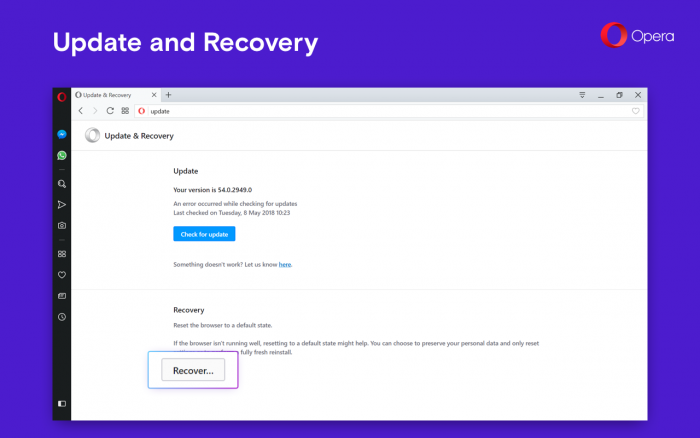 In addition, there will be an “Update & Recovery” option visible in the O menu* (or from Opera in the menu bar for Mac users). This will open a page where you can check for an update yourself. Keep your data and reset the rest of setting. This will revert your search engine to its default, remove pinned tabs and rest browser settings. 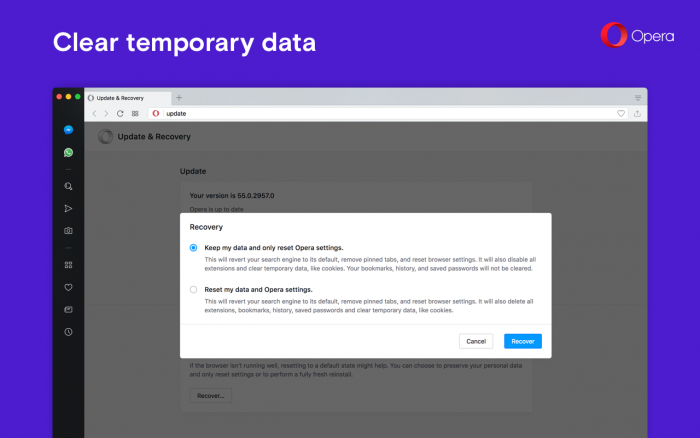 It will also disable all extensions and clear temporary data, like cookies. Your bookmarks, history and saved passwords will not be cleared. Reset all your data and Opera settings. This will revert your search engine to its default, remove pinned tabs, and reset browser settings. It will also delete all extensions, bookmarks, history, saved passwords and clear temporary data, like cookies. When an update is ready, you’ll see the Update now button of the Recovery page. Pressing the Update now button will refresh the browser with a new version. *Linux users: please note! The Update & Recovery option is placed in the Edit section on the menu bar. This is a bug and it will be fixed. Expect to find it in its proper place, as it is for Windows, soon. We’re continuing our work on Instant Search and Flow. There are a lot of changes in settings page, too. We also fixed a bug causing white flashes on the start page. Here is the link to the changelog.